Put a cushion on the floor for your jaw & behold auroras over Norway. Wake up & dream: Steve Volk chats about his recurring nightmare. Whitley Strieber talks about the alien abduction phenomenon. If you think aliens are all shades of Grey, meet the Archons. Literary great Henry Miller had a little-known interest in UFOs. Pilot’s 1967 encounter with a dancing UFO corroborates Shag Harbour incident. Retired Chilean Air Force General will speak at UFO conference next month. Psychics couldn’t possibly have spotted alien artifacts on the moon, because remote viewing is pseudoscience right? Russian scientist claims proof of life on Venus in probe photos. Independent researchers find no evidence for arsenic life. To prove not all blackbirds are black, you only have to find one white blackbird. Consulting Spirit: a doctor’s paranormal experiences (Amazon US, Kindle, & UK). Old Diary Leaves & the true story of the Theosophical Society. Egyptians gave mummified ibis birds a packed lunch for the afterlife. Construction workers in Belize unearth Maya artifacts. A brilliant new web portal has been launched for Hopi petroglyphs. Technology allows a peek beneath Ohio’s ancient earthworks. Oldest known dinosaur nests found in a South African park. Stem cell breakthrough could save endangered snow leopards. Despite the rumor mill running wild, Monsanto did not buy Blackwater (Xe)… they only hired their services. Yeah, that’ll make me sleep so much better at night. Magic mushrooms should could be used to treat depression. Empirical evidence shows getting back to nature can heal the mind. Thanks to Blue Pill Sober & hiddenplace. Remote Viewing Spaceship on Moon – pseudoscience? Re remote viewing is pseudoscience by Ray Villard…Ray wrote: “Government involvement (and gullibility) alone doesn’t legitimize what is clearly a pseudoscience that ranks alongside astrology, ghost hunting, and “telekinetic” spoon-bending.” Apparently Ray is not at all informed with the very accurate results obtained in many cases. Of course there is an equal amount of B.S. put out by fakers for either notoriety or profit motives. Ray wrote, “no natural particles or fields capable of carrying information into the human brain, independently from the five senses, have ever been quantitatively measured in a physics laboratory.” So? When did measureability become the benchmark for reality? The “science of physics is based on theory” later verified through measurements only after our technology has evolved to a degree to “quantitatively measure the benchmark.” Based on his standard of criteria, much of groundbreaking physics is pseudoscience. Just because we are not yet capable of measuring in a lab something does not negate its existence. Ray wrote, “And, as is typical of a pseudoscience, remote viewing claims contradict fundamental physics such as the speed of light barrier and causality.” Apparently poor Ray is not informed about nonlocality and Alain Aspect’s 1982 experiment with twin photons proving either faster than the speed of light communication or more likely that they are nonlocally connected. I don’t have an opinion whether Appolo astronauts found a spaceship on the moon or not, but the ardent skepticism and condescending tone of Ray Villard’s attack on Remote Viewing is typical of the close minded arrogance and protectionism of the establishment when confronted with paradigm threatening ideas. Absolutely agree with both points, Greg. Ray Villard has demonstrated the classic syndrome of pseudoskeptics — “don’t bother me with the facts, my mind is already made up.” I wouldn’t mind so much if it weren’t for the snarky holier-than-thou tone of the article, that’s what gets under my skin. Ridicule and abuse — the two most trusted tools in the pseudoskeptic toolbox! Maybe I’m crazy —Ok fine, drop the ‘maybe’— but somehow the beautiful colors of these celestial phenomena remind me of the iridiscent feathers of the Quetzal bird. Would we get to see a magnifiscent aurora spectacle later in the year, down here closer to the Equator? 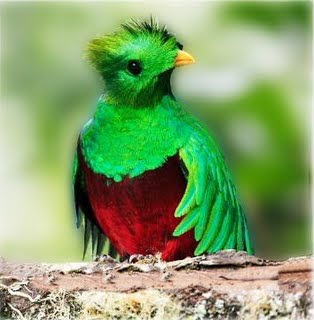 Interesting point about the colours of the Quetzal bird, though. Oddly, there’s not much in Norse mythology connecting the Northern Lights to any particular being, except for the belief that the auroras are the flickering lights reflected off the armour of Valkyries (swan maidens). However, the auroras have been witnessed by Romans, even Aristotle in Greece. In the 6th century BC, the Hebrew prophet-priest Ezekial wrote, “…a whirlwind came out of the north, a great cloud, and a fire infolding itself, and a brightness was about it, and out of the midst thereof as the color of amber, out of the midst of the fire.” Some interpret this as Ezekial describing the auroras. Did Mayans travel north and witness the auroras? Who knows. Quetzal bird feathers were traded with Native Americans of the Southwest, so it’s possible there may have been trade further north, or tales traveling south at the least.